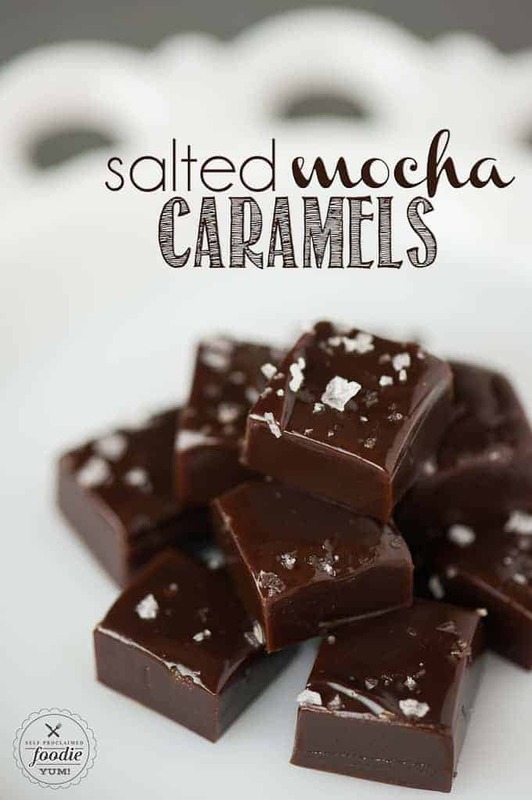 Soft and chewy old fashioned Salted Mocha Caramels made with rich chocolate and coffee powder are a tasty candy treat perfect for the holidays! Whoa – we’re on day 4 of 12 of my treat marathon and its not even Thanksgiving yet! I’m not normally this prepared. Don’t let me fool you – I will be scrambling to make the rest of my holiday recipes over Thanksgiving weekend. 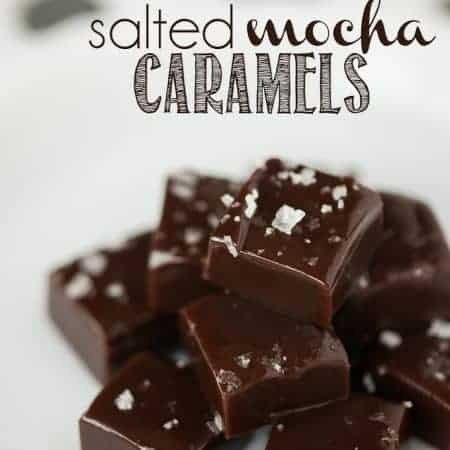 Oh salted mocha caramels. Where have you been all my life? Seriously, where? 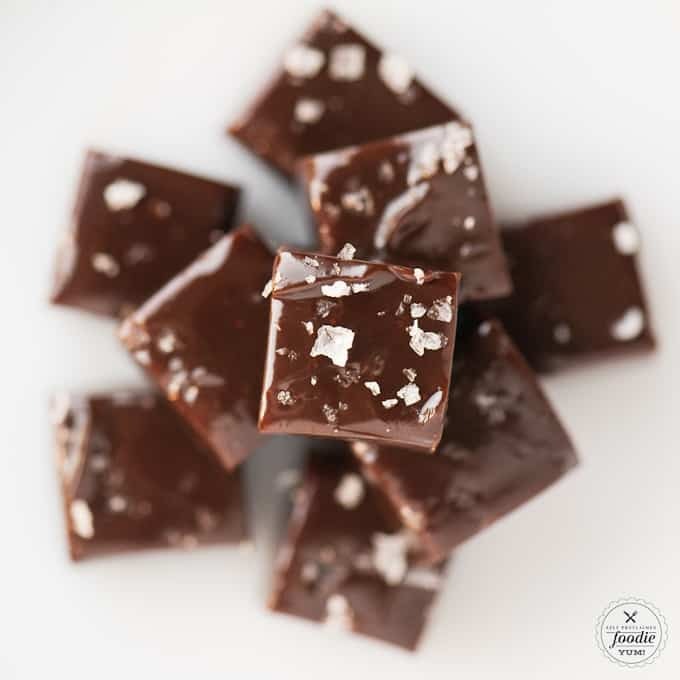 You have everything my tastebuds desire – coffee, chocolate, sugar, fat, and a touch of salt. I mean, what more could a girl ask for? Yesterday I talked about how I’ve overcome my fear of boiling sugar. That being said, you might find a trend in this year’s holiday treats. Yup – more candy than cookie recipes. Don’t get me wrong, its hard to be the perfect trifecta of sugar + flour + butter, but I’m slowly learning that there are many gluten free delights that are just as good, if not better. Don’t worry, there will still be some cookie recipes. I’ve already posted one and a I have a couple more on the way. But this year’s Christmas box will be about 2/3 candy and 1/3 cookies. I wonder if my hypercritical younger sister will give me praise or condemnation for this dramatic change in holiday tradition. I’ll be sure to report back. 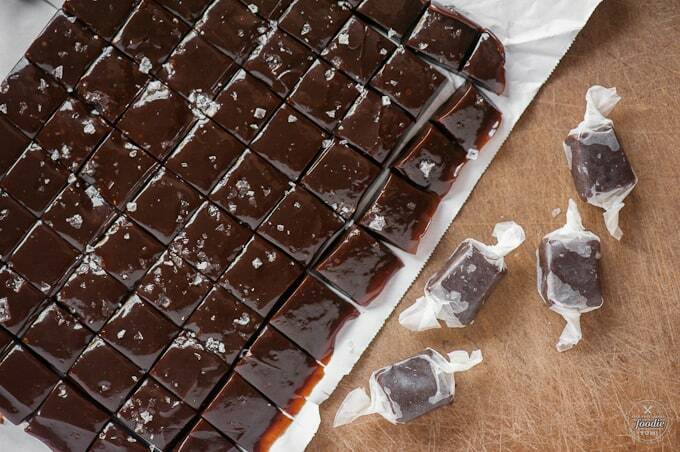 I have found that making your own homemade caramels are one of the best things a person can do. First, eating caramel that is super fresh will change your life. 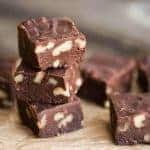 Second, creating perfect caramel without inflicting a major burn to you or the persons around you, as well as making caramel that is not under or overdone, should be considered a personal milestone in one’s life. Third, caramels of this quality are pretty freaking expensive. Don’t believe me? Just go to a place like Whole Foods this time of year and find some artisan caramels. You’ll have to decide whether you want to buy the caramel or feed your family dinner that night. And lastly, people are pretty darn impressed when they open up that little wax paper bundle, pop this treat into their mouth, and marvel at the fact that you actually made it. All by yourself. In your own kitchen. Impressive. These are definitely different than regular caramels. They are darker. They are richer. They are more intense. I was about to throw in one of those “I like my caramels like I like my men” jokes but I’m guessing you were already anticipating that. 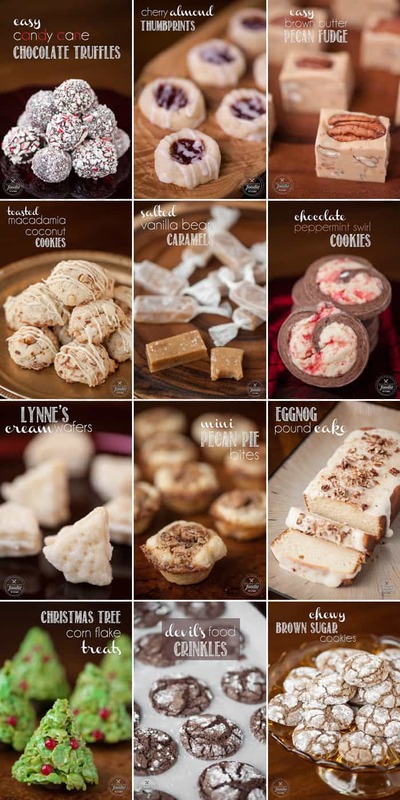 Bottom line, if you make one naughty treat this year, it should be these. However, I will likely say that about everything I make this year because my blog contributes to my cooking narcissism. 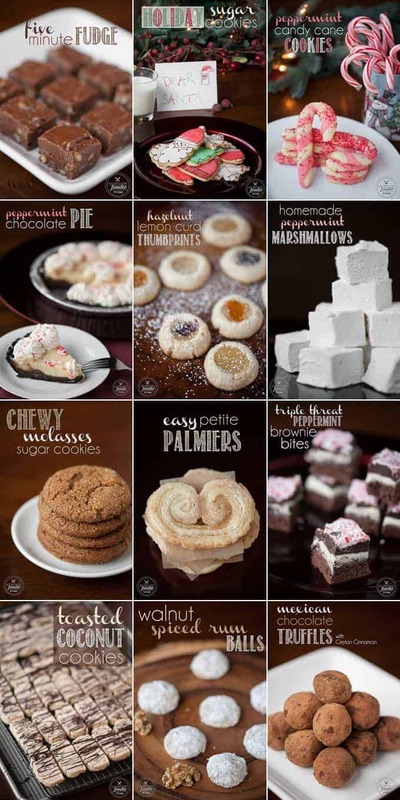 Be sure to scroll past the recipe to feast your eyes on all the holiday treats I’ve made over the last couple of years! Line an 8" square pan with parchment paper. Set aside. Combine the cream, vanilla extract, and espresso powder in a medium-sized saucepan and heat while swirling until scalding. As soon as the mixture starts to bubble and appears to coat the bottom of the pan, you'll know its done. 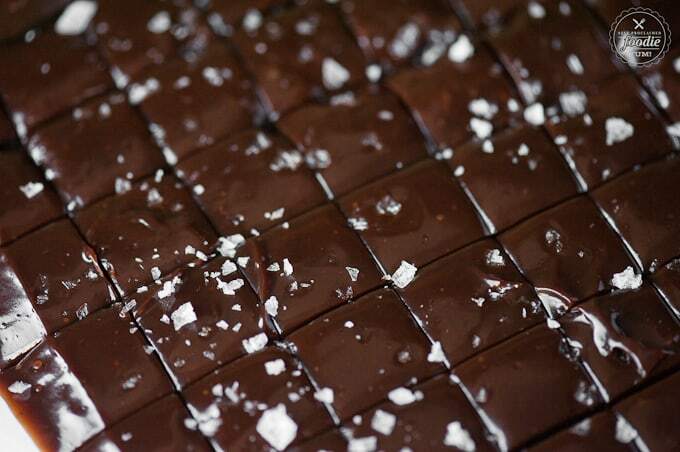 Remove from the heat, add the chopped chocolate and allow to sit for a minute to allow it to melt. Then, stir until it turns into a completely smooth mixture. Stir in the butter. Using a medium to large (at least 4 quart) pot, combine the sugar, corn syrup, and water in this large saucepan and stir to combine. Heat mixture over medium heat until the sugar melts and then increase heat to high to bring the mixture to a full boil. 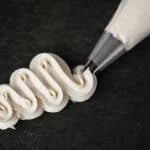 You may occasionally swirl the mixture but do not stir. You may also use a brush to run water down the sides of the pot to wash down any crystals - this will eventually evaporate. You want to cook the sugar just until it starts to change color and take on more of a caramel color and smell. You'll notice a reduction in the bubbles at this point too. Remove from heat. To make the caramel, pour the chocolate cream mixture into the sugar, stir to mix, and add your thermometer to the pot. Bring to a boil over high heat and whisk constantly until it reaches 245°F. The moment it reaches temperature, pour it into your prepared pan. Do not scrape out anything that has stuck to the pan as it may have been overcooked. Allow the caramel to sit for about 10 minutes before sprinkling with salt. If its too hot, the salt will sink in. Start with a small amount and if it sinks, wait a bit longer to add the rest. Allow to caramel to cool completely at room temperature. Transfer to a cutting board and cut into small pieces. Wrap them individually in wax paper. 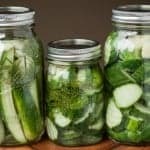 If you cut the pieces and don't wrap fast enough, they will stick together, so you may want to cut just a few rows at a time. 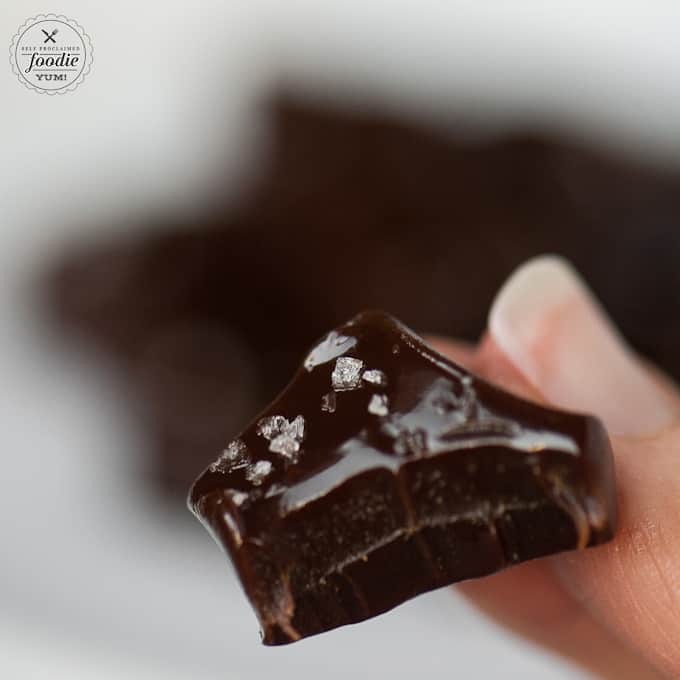 Store wrapped caramels in an airtight container at room temperature (or you may freeze) until you're ready to share. 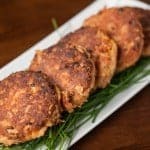 These look fabulous and I’m going to try this recipe! 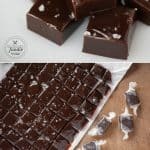 Any tips on cutting the caramels? Mine always stick to the knife and I have to constantly wash the knife after each cut. Hi Pearl, I don’t remember having an issue cutting these because they had just the right amount of sticky where the knife didn’t get all messed up. No extra work was needed!